Anuj hails from the land of Mahatma and has been trying to figure out what The American Dream is really about since 2009. 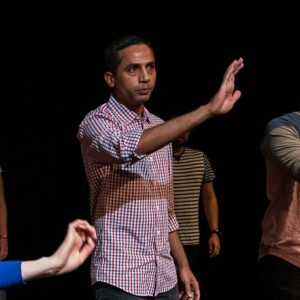 Anuj stumbled upon Improv classes back in Atlanta when looking for something new to try and got hooked after having so much fun in his first class. Now he holds unverified world record of taking Level 1 classes highest number of times and has been trained in Atlanta, Charlottesville, UCB NY and finished WIT curriculum in 2017. He is part of Indie team Bombay Vindaloo which performs Improvised Bollywood movies and also performs with Thermal Runaway at LIT. Other than improv, he enjoys reading fiction, travelling to new places and Salsa dancing. Anuj is a man with big dreams. Some of them are to start cooking and finish UCB curriculum one day.